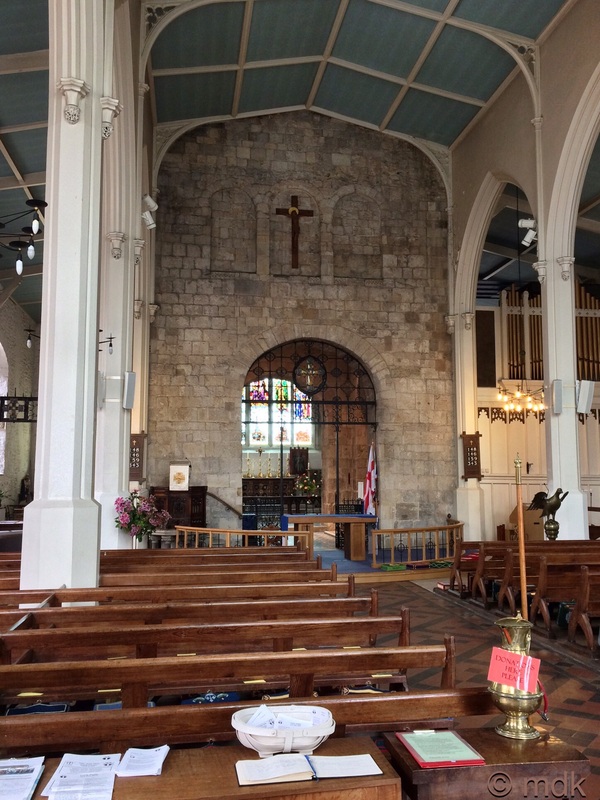 After the Norman Conquest, when the French came to live in Southampton, they worshiped in a church dedicated to the patron saint of Normandy, St Michael. That church still stands today. At the point where French Street becomes Castle Way there is an alleyway leading to Bugle Street and St Michael’s Square. To me this always feels like the place when today meets yesterday with a modern building on one side and the stone wall of the church on the other. CJ and I walked down this alley heading for coffee and, at the other end, it was like walking back in time. If you turn your back on the modern buildings in Upper Bugle Street, it’s easy to imagine you are standing in another time. 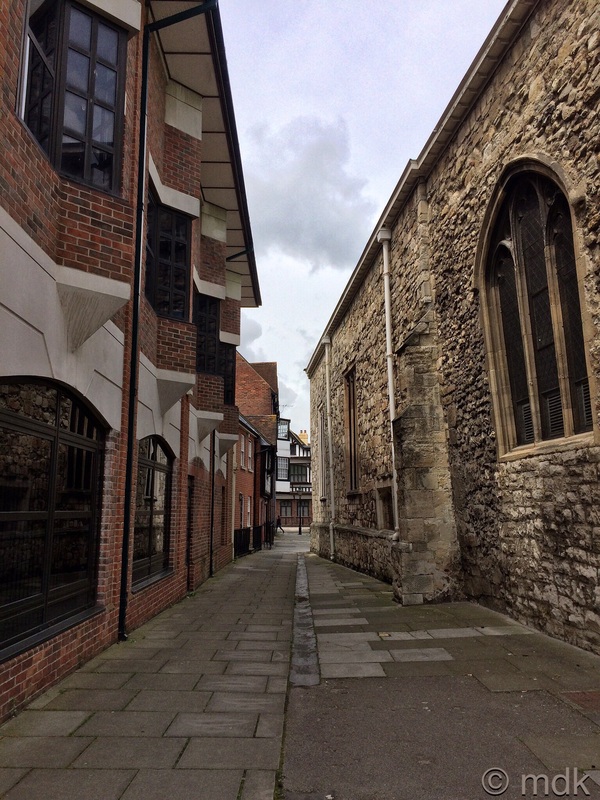 Face to face are two of the oldest buildings in the City, Tudor House Museum and St Michael’s Church. We may have had coffee on our minds but there was no way I could pass by without taking a couple of photos. In Fact CJ already had his phone out to take his own pictures. 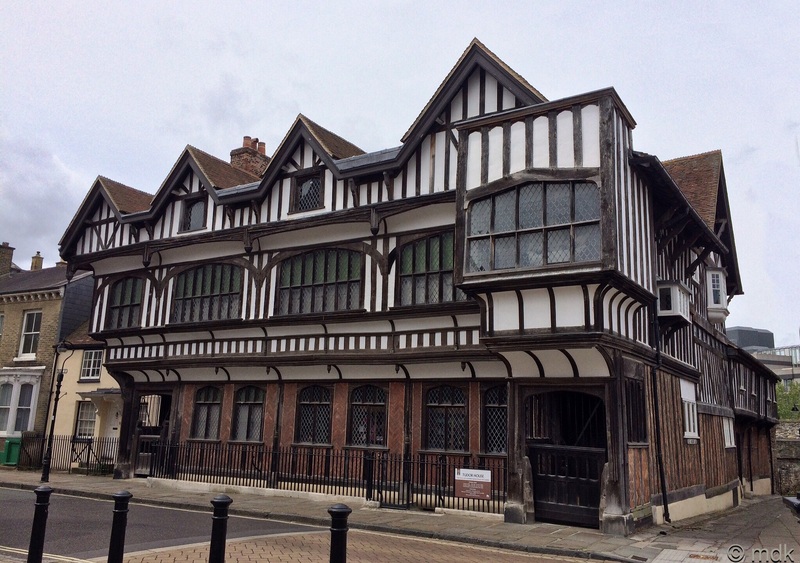 We began with Tudor House, one of the most important historic buildings in the city, with over eight hundred years of history under one roof. 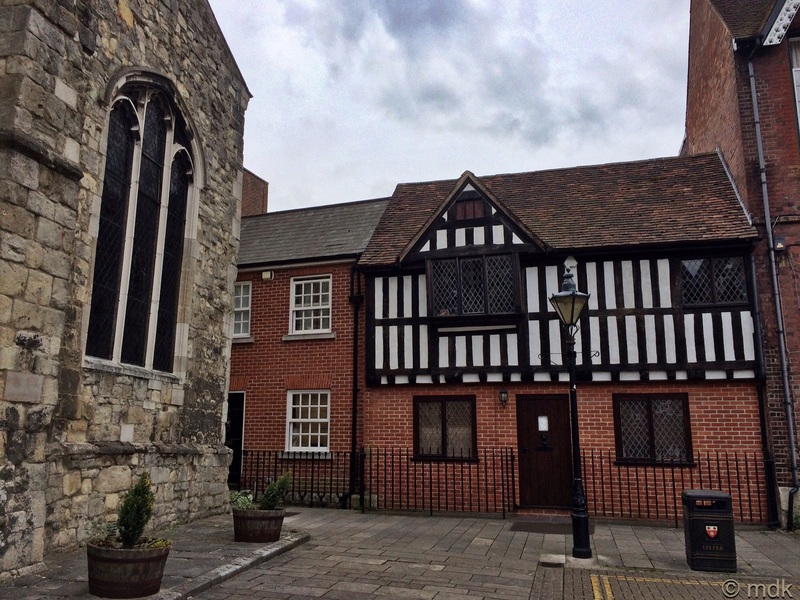 The timber framed building seen from the square dates from the fifteenth century and was built on the site of King John’s Palace, a Norman House, three hundred years older. This is the oldest museum in Southampton, established in 1912. A couple of years ago, when I was struggling with coming to terms with being made redundant, Commando took me on a visit to cheer me up. You can have coffee there and I’m probably overdue for another visit but, much to CJ’s disappointment, it is closed on Mondays. Then we turned to the church. 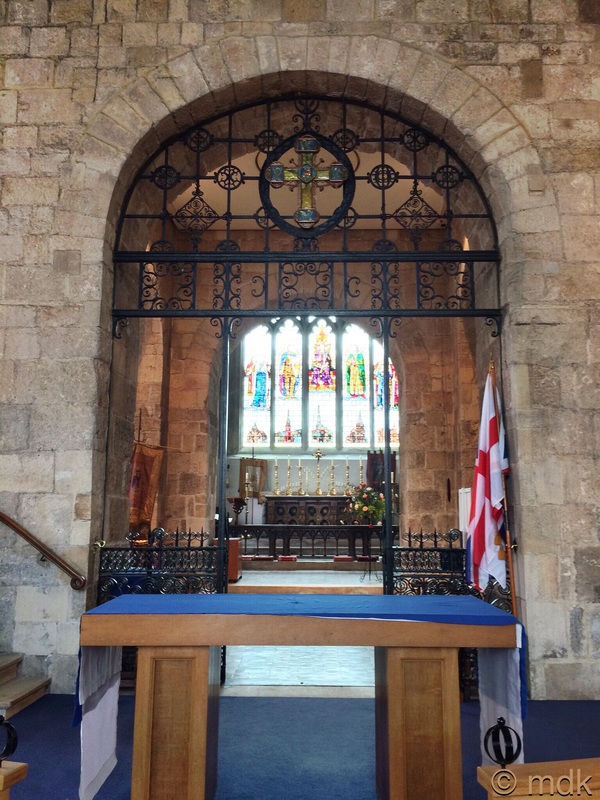 Founded in 1070, this is the oldest church in town and the only one of the five original churches within the town walls still in use as a place of worship. Unusually, the door was open and, when we looked closely, there was a sign saying Open For Visitors. Glancing at CJ, I raised an eyebrow, “shall we have a look?” He screwed up his face and didn’t look too keen. Like me, he’s not comfortable just wandering into churches. 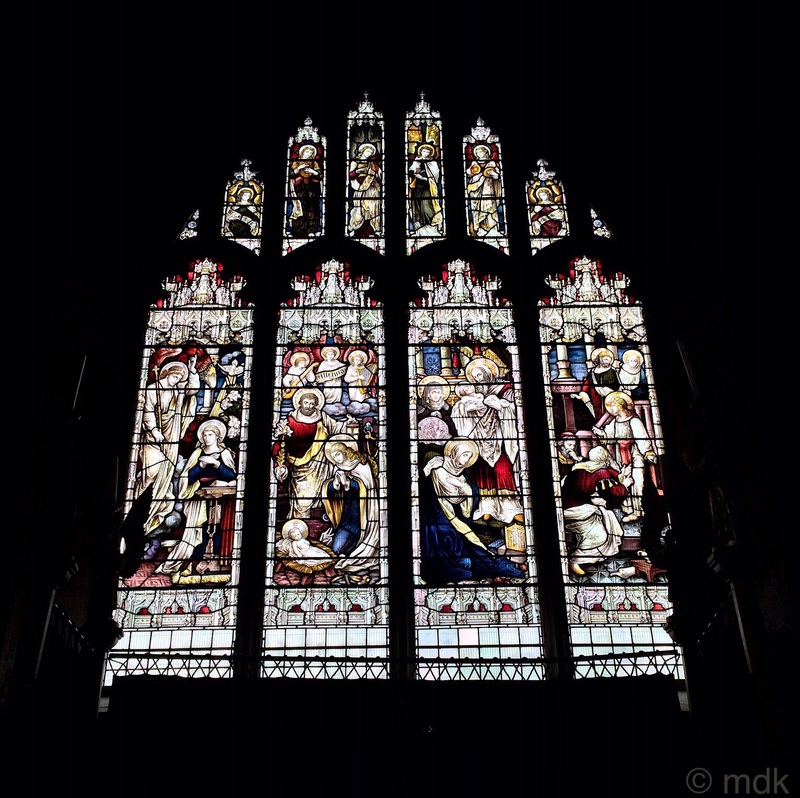 It seemed too good a chance to miss though, if nothing else for the stained glass windows. I really am a sucker for stained glass. “You can stay outside if you like, but I’m going in,” I said. Of course he followed. There were three ladies of a certain age inside. They greeted us as we entered and said it was fine for us to take pictures but otherwise left us alone. Almost at once we were facing the most famous tomb in a Chuch filled with tombs. There in the north western corner, surrounded by fluted columns was a life sized representation of the Sir Richard Lyster, his stone head resting on a stone pillow. In life he was Chief Baron and Lord Chief a justice of the Common pleas. 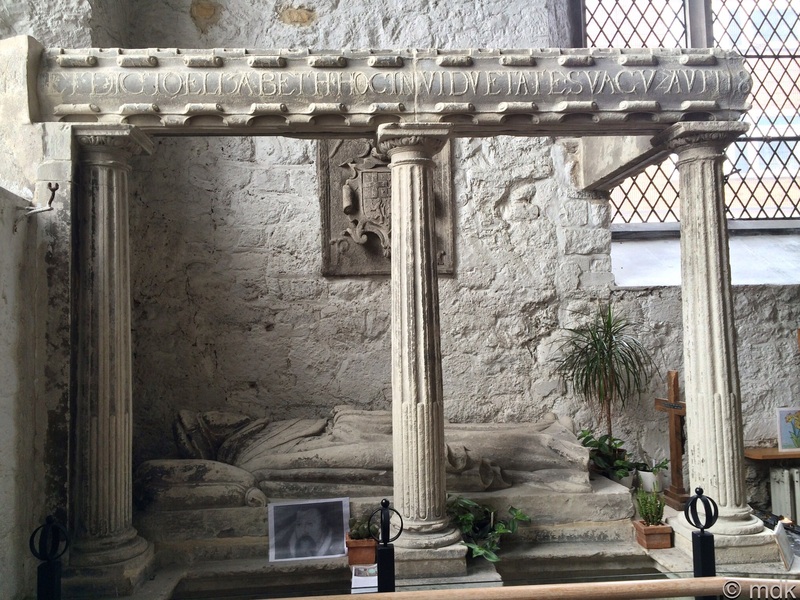 The tomb dates from 1567. Suddenly CJ forgot he was uncomfortable and began to look around in amazement. We walked slowly through a wrought iron arch towards the oldest part of the church. As we walked we realised the flags we trod on were actually tombs. At first we felt bad to be standing on what we’re basically graves, as if we might disturb the dead, but there was nothing for it, there was no part of the floor that wasn’t also a tomb. 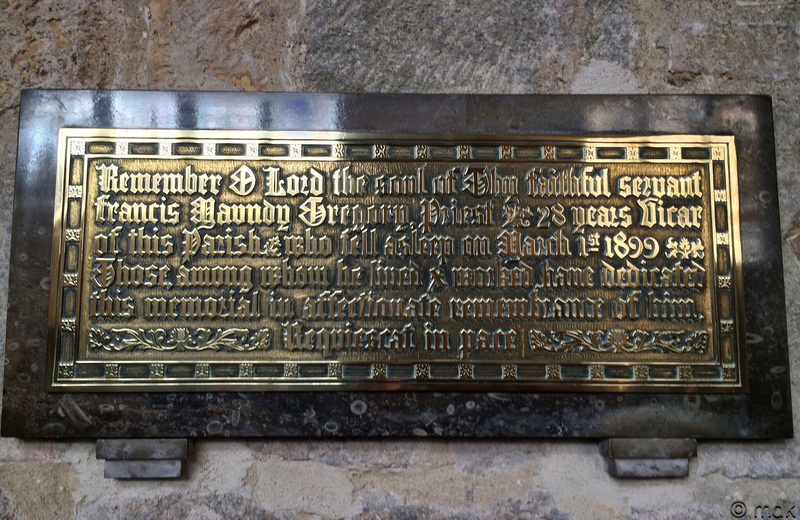 St Michael’s, along with Holyrood, St Lawrence and All Saints churches were granted to the monks of St Denys by Henry II in 1160 and remained in their care until the dissolution of the monasteries in 1537. After this St Michael’s passed to the crown. The original building, dating from 1070, was built on a cruciform plan with the oldest part at the eastern end of the church. During the Middle Ages the town prosepered and, being in the heart of it, the church prospered with it. 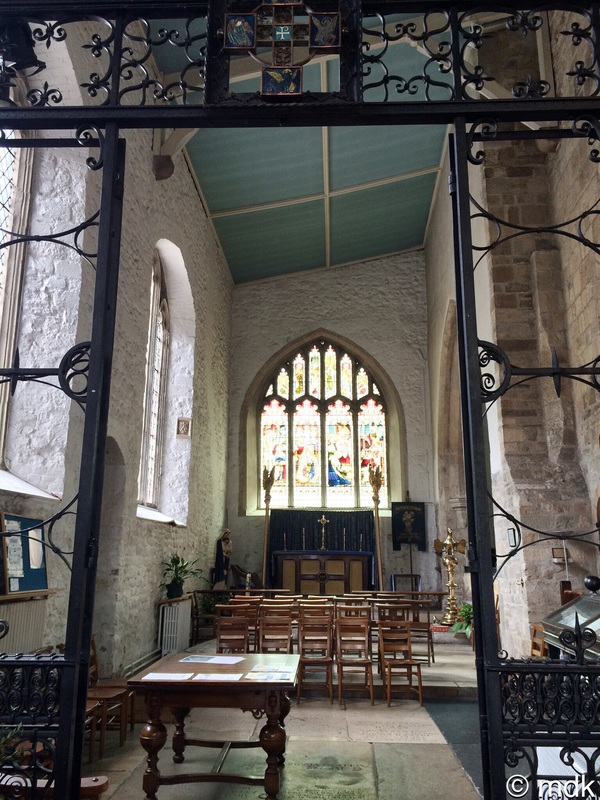 In the thirteenth century chapels were added to both sides of the eleventh century chancel. Originally the additions were built from wood but, in 1338, when French pirates stormed the church during mass and set it on fire, these were destroyed. During the fourteenth and fifteenth centuries the burnt extensions were replaced with stone, and this was where the wrought iron arch led us. In the north eastern corner we came to the first of the stained glass windows. While I may not be a church goer, and prefer my spiritual experiences to come from Mother Nature, there is something about light coming through stained glass that fills me with joy. Of all the things that man makes, combinations of coloured glass and light seem to be the most lovely and the closest to the beauty nature provides. Of course, that’s just my opinion. Soon after the repairs, the north and south aisles were widened and the church went from cruciform to rectangular as it is today. When this work was completed a spire was built and, in 1732, a further nine feet was added to this to make it a better landmark for shipping. Today the elegant 165 foot spire can be seen from many parts of the city and is still a landmark from the sea. Unfortunately, after the French Raid, the fortunes of the town declined and the church was badly neglected. 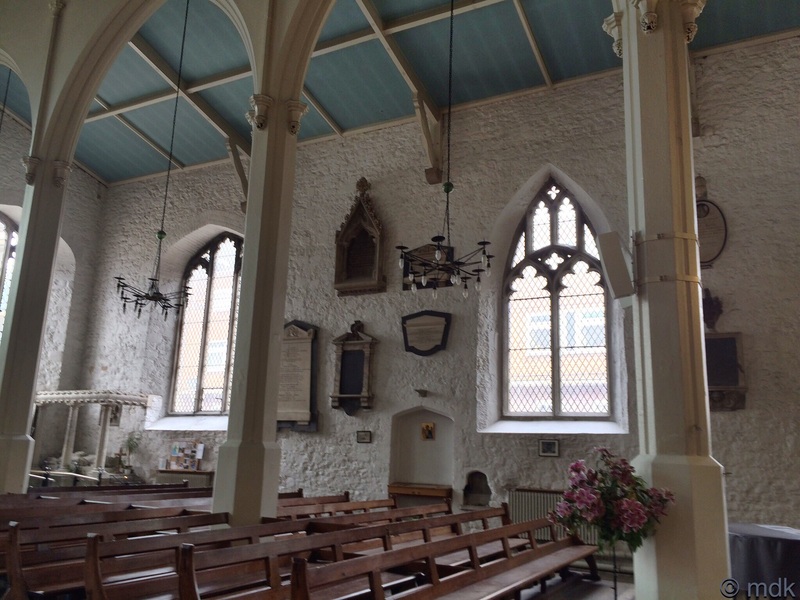 A further addition, the chantry chapel, added to the south of the church in the sixteenth century, was let as a house and later a barbers shop. By 1880 it was in such a bad state it had to be pulled down. http://www.ancestryimages.com/engraved by J.Shury & Son after a picture by G.S.Shepherd, 1839. 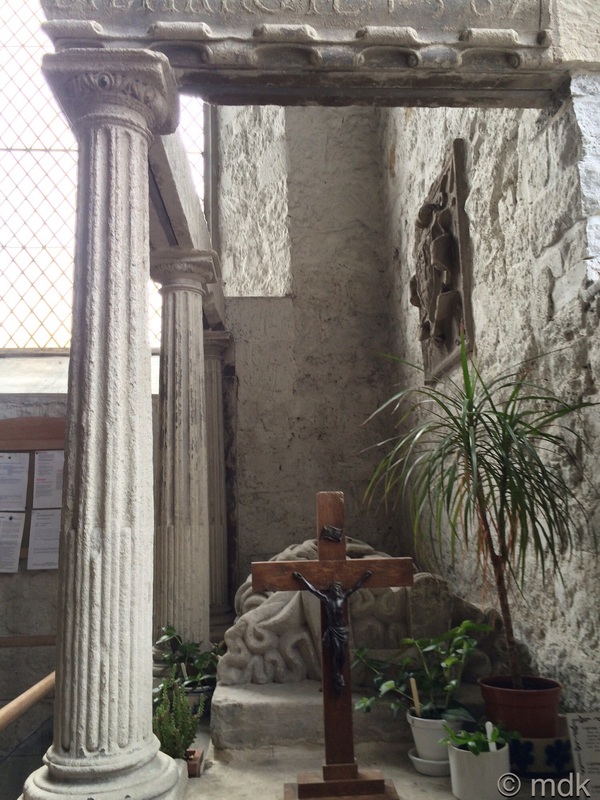 We walked through a high stone arch into the oldest part of the church. It was strange to think that we stood in a building that had been constructed almost a thousand years ago with walls more than three feet thick. 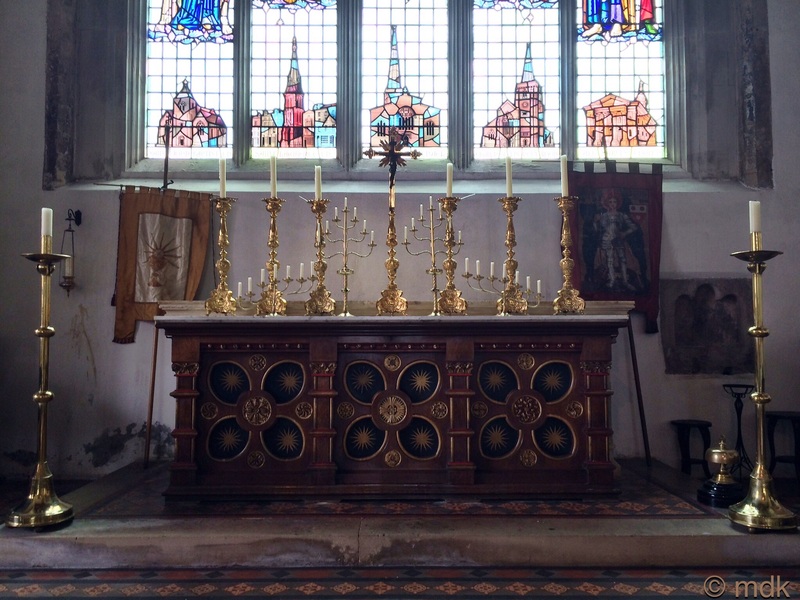 In front of us was a wooden screen, later we learned that the decorative moulding on this was the only surviving medieval woodwork in the church. 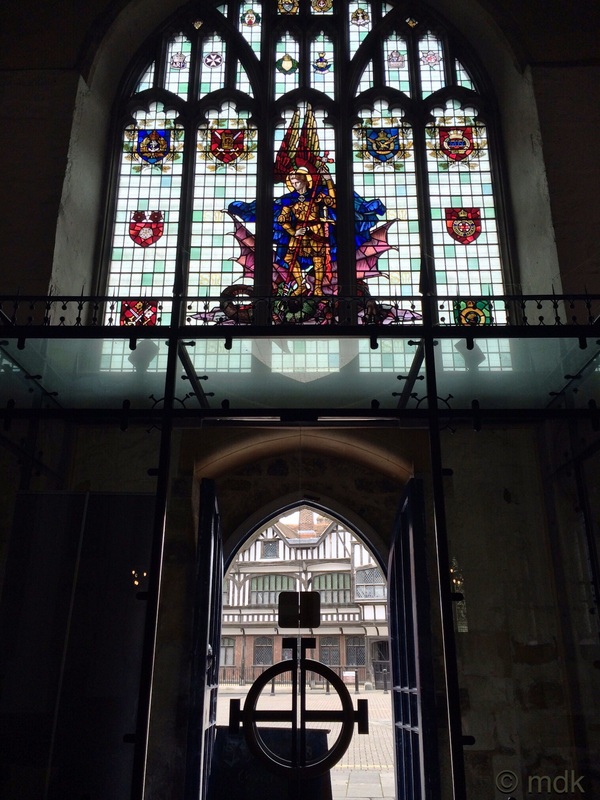 Here there was another beautiful stained glass window, this one depicting the five churches of medieval Southampton. St John’s once stood in French Street but was pulled down in 1708, St Lawrence was demolished between the wars and Holyrood and All Saints were victims of the 1940 blitz. St Michael’s is the only one to remain. Beneath the window were an array of golden candle holders and a crucifix all on top of a beautifully decorated wooden cabinet. “Are they gold Mum?” CJ asked, his eyes almost popping in wonder. “I should think they’re brass, or at least just gold plated,” I said, hating to disappoint him. On the wall was a golden plaque mounted on marble. Whatever they were made of, they were lovely. 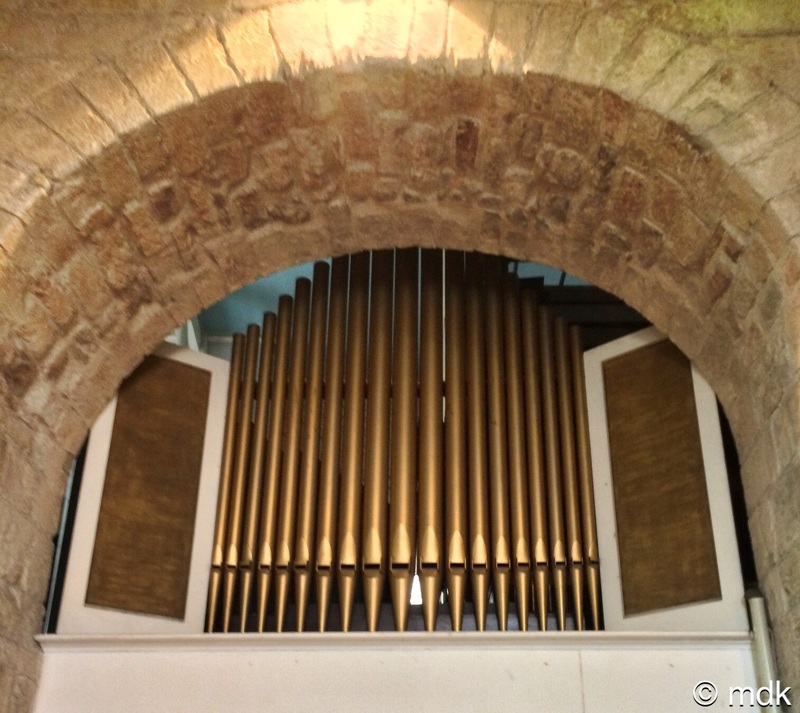 In another arch we saw the pipes of the organ and, as we looked at it, music began to play. It was no miracle, just the three ladies turning on a tape recorder but for a brief moment it had us fooled. The organ was built by H C Sims in 1880 and enlarged by J W Walker in 1950. What I know about organs you could write on the head of a match in marker pen but it looked impressive. 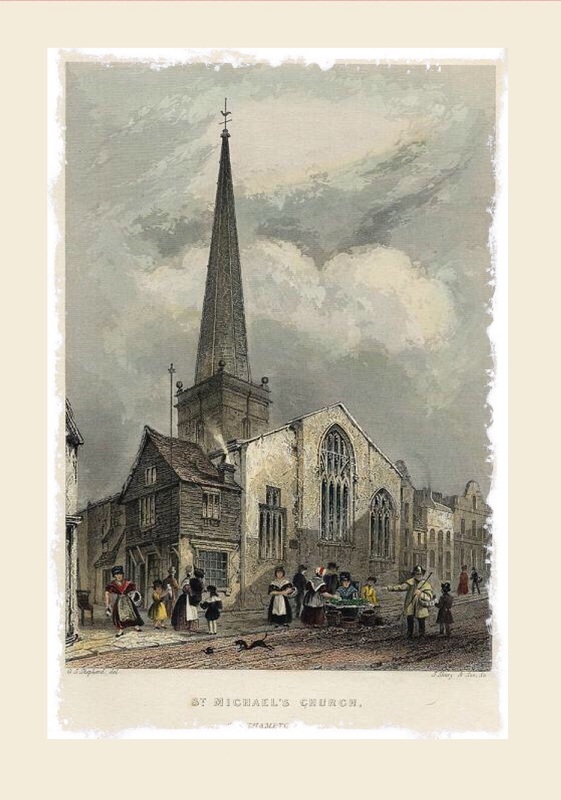 Finally, in 1836, after all the years of neglect, a new vicar came to the church and he had grand ideas of a major reconstruction. There were new pews, the floor level was raised, the aisles heightened, wrought ironwork installed and the roof reconstructed. New galleries were added and much more besides. The work cost a pretty penny, £2,390, to be exact but the parish thought it was worth it. We slowly made our way back to the front of the church, unsure what was old and what part of the vicar’s reconstruction. 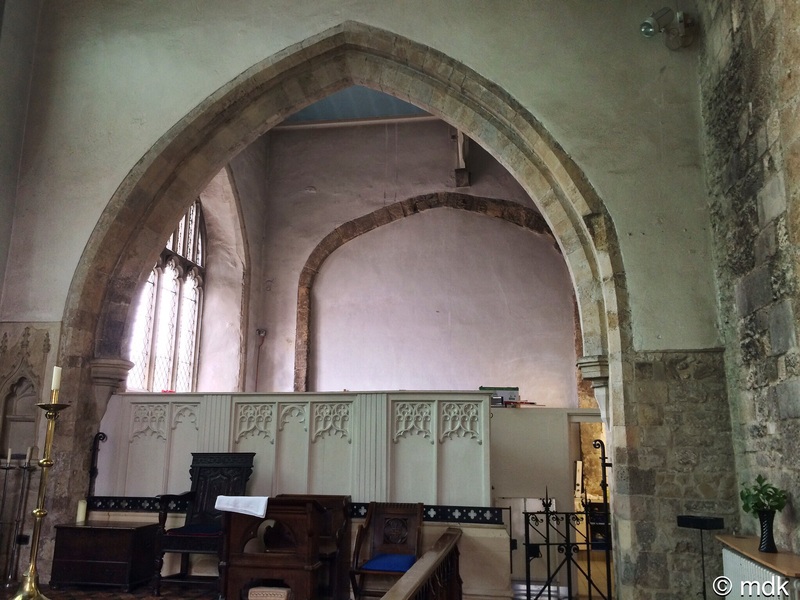 To the left of the door was the ancient font. Carved By french craftsmen from a single block of black Tournai marble in 1170, the font stands on a single column supported by four modern purbeck marble pillars. 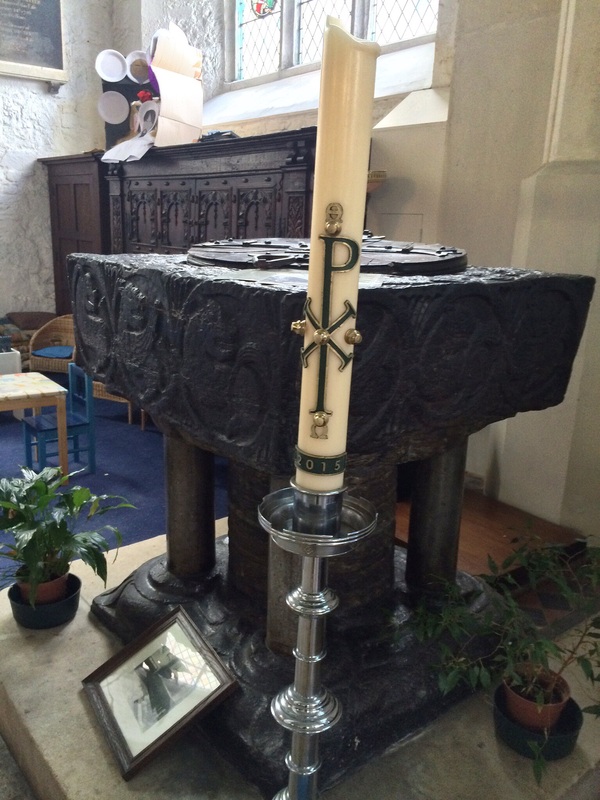 This is one of four Tournai fonts in Hampshire, there is another in Winchester Cathderal. Almost back where we started the ladies thanked us as we dropped what coins we had into the collection box. There was certainly much that we missed because there was just so much to see. Above the door there was one more stained glass window. This one depicts St Michael slaying a dragon. Before we left there was one more photo. Turning, I looked back through what would once have been the medieval church, it has come a long, long way since then. When we saw the open door we were slightly reluctant to go inside. We’d been heading for a coffee after all and CJ was not at all keen to walk around a boring old church. Now we were reluctant to leave. We walked out into the square like two bleary eyed, disoriented time travellers. 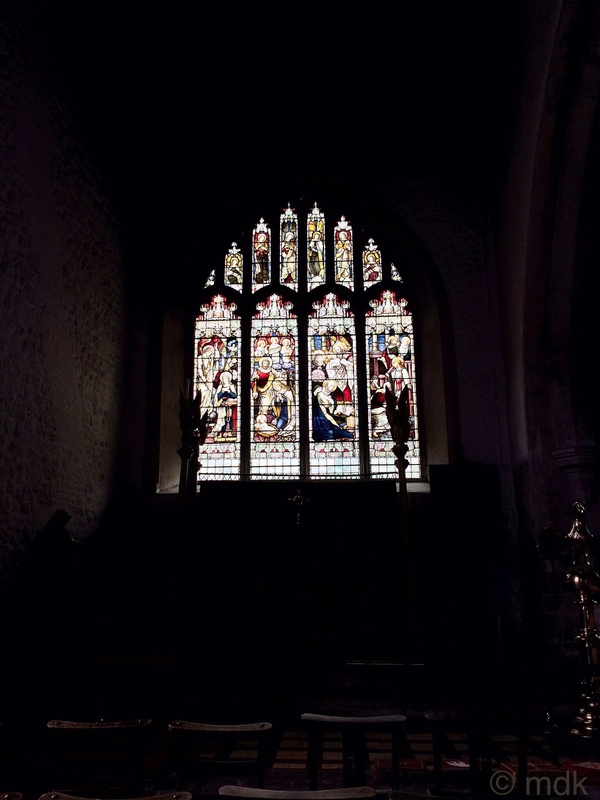 It was chance that brought us to the door of the church, chance that it had been open and the ladies so welcoming to two nervous looking strangers. There was a big dollop of chance involved in the church being there for us to see at all. 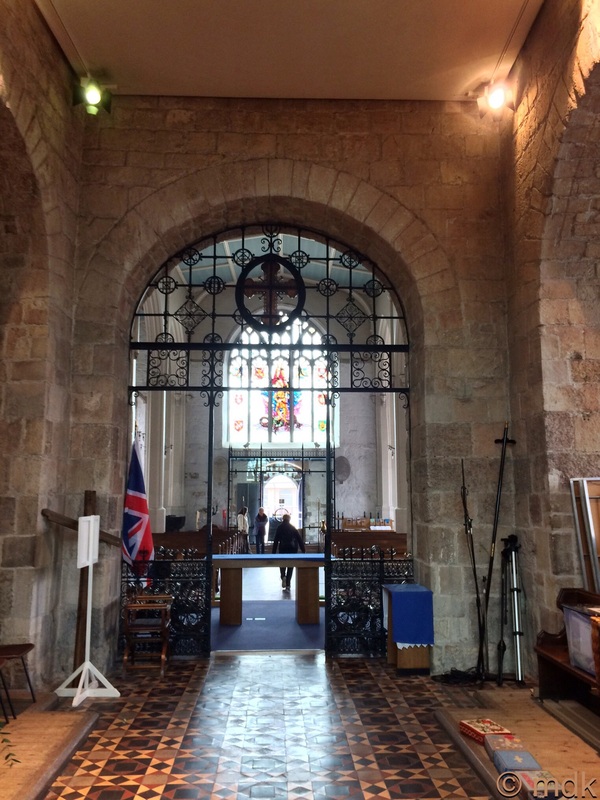 Once there were five ancient churches within the town walls but time and war time bombing left just one, St Michael’s. It was spared by the Luftewaffe because the tall spire was too useful as a landmark and they were ordered not to bomb it. I’m pretty glad it worked out that way. 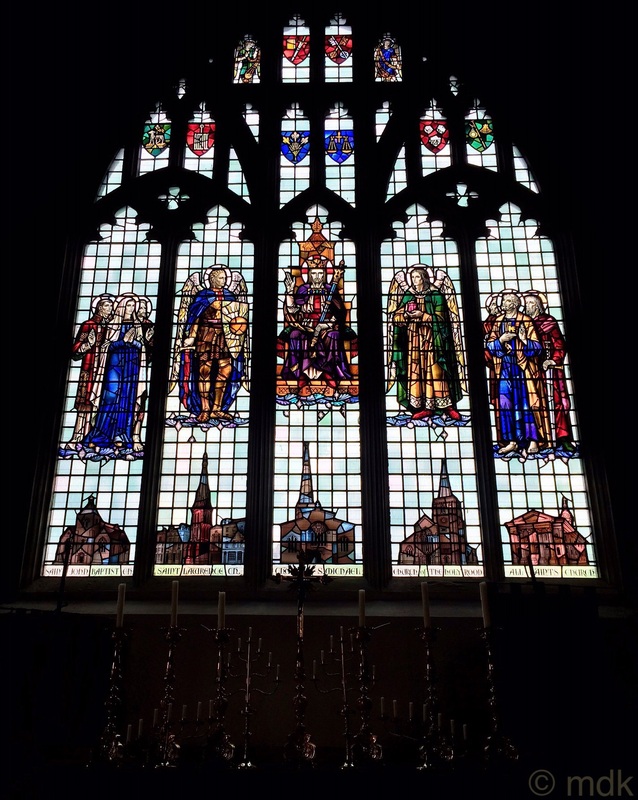 Of all the stained glass windows the one of each Saint with the churches is my favourite, one of these days will go inside and see it for myself. That’s my favourite too. If you get the chance it’s well worth a visit. That’s quite a church but I wonder how it would feel knowing you were walking over all those graves. I don’t suppose the inhabitants mind though, so why should we. The windows are indeed beautiful and I’m glad you got to see them on a sunny day. I wonder what it was like to be a conquered people. It couldn’t have been fun, especially for men of my age who could still swing a sword. I’m sure the discomfort didn’t last long though. Most likely I and others like me would have been put down quickly. Although I know the dead can’t possibly mind I always feel bad to walk on a grave. Those windows made my day. I should think it was hard to live in the town at the time of the French raids and after the Norman Conquest but I think the people made the best of it and it was the last time we were ever invaded. At last, so far. You gave us a fascinating glimpse of centuries of history, most interesting. 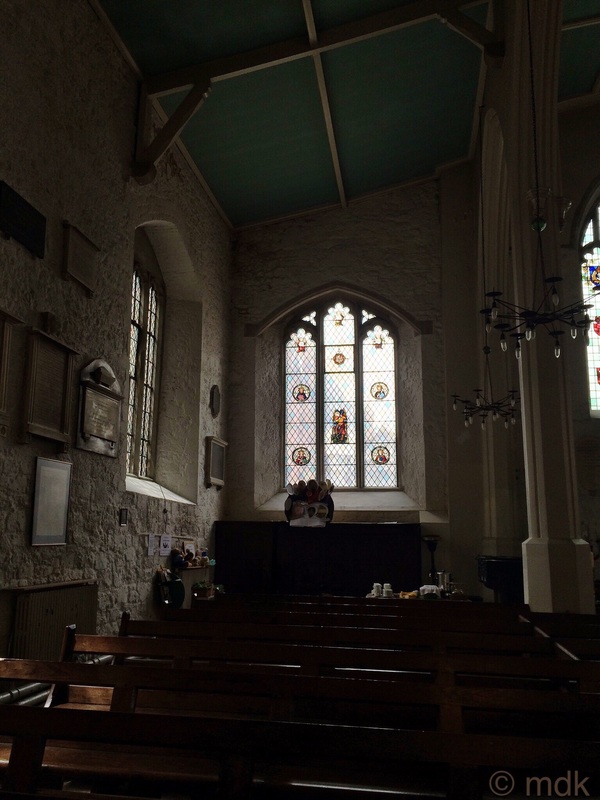 Thank you for a fascinating blog……sad to say the last time I was in St Michaels I was being christened in that French font. Really should pay it a visit….it looks awesome! Glad you enjoyed it Roy. What a place to be christened! Somehow I don’t think Bitterne Church can trump that. It’s well worth a visit although I’m not sure how often it is open to go inside. You had me at the first photo. Suddenly all the historical novels I have read kicked in and I was picturing the what you lead me through as it must have been hundreds of years ago. So enjoyed this journey and the fact that you got to do it with CJ is wonderful. Sometimes walking through this old city I do feel as if I’m walking back in time. I’m glad you enjoyed it. 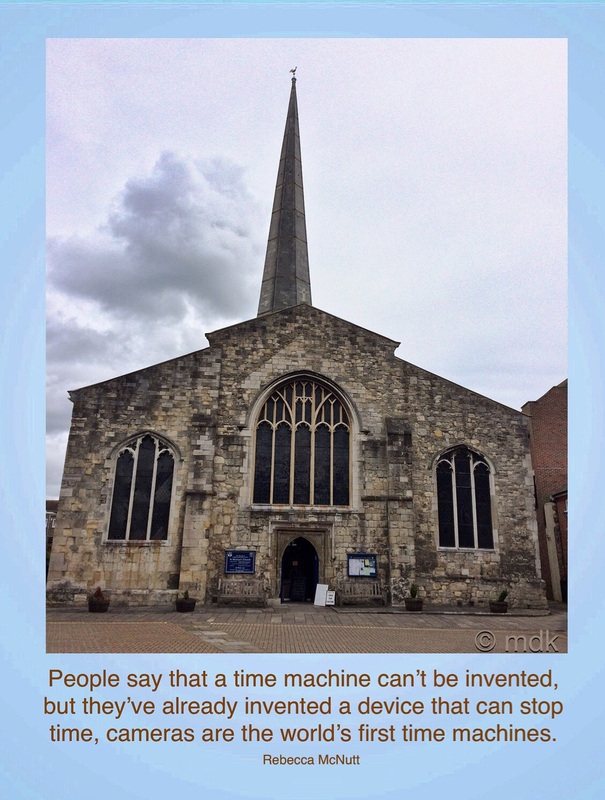 Wow, I didn’t know St Michael’s was spared as it was a useful landmark! It’s some kind of weird blessing in disguise?! 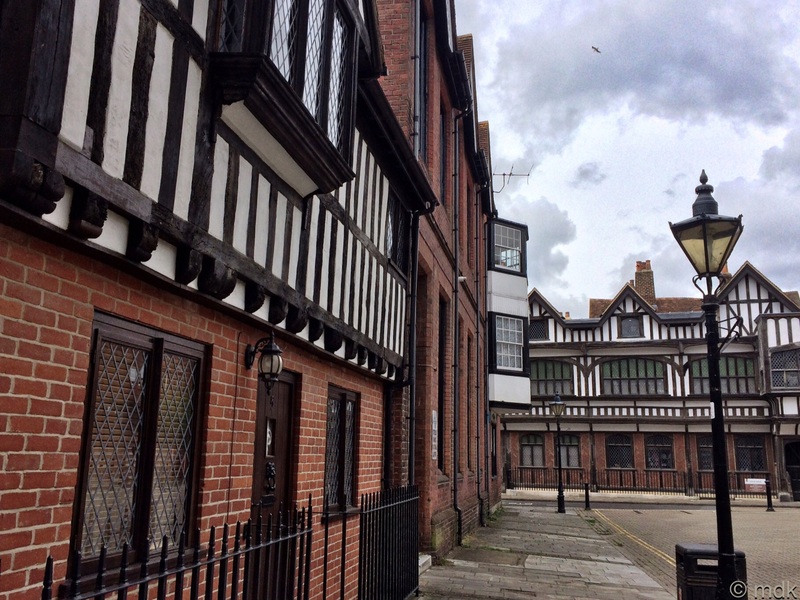 I am so sad when I think if how much of Southampton was destroyed during WWII, I remember reading that Jane Austen thought it was one of England’s most beautiful cities… What a shame so much if it has gone. It is a shame so much was lost to the blitz but I’m glad so much was spared, especially the walls.